Mish's Global Economic Trend Analysis: Tips on Navigating Obamacare Costs on HealthCare.Gov - My Personal Experience - Obamashock! Tips on Navigating Obamacare Costs on HealthCare.Gov - My Personal Experience - Obamashock! You can now see cost options of various Obamacare plans whether or not you are registered. Once on the site (click on the above link), filter your state and county. Click on the lines as shown by the arrow, not the "i" symbol. Don't bother with the instruction line at the top of the form that reads "For instructions on how to read and use this data, please view the documentation available under the ‘About’ tab on"
After you click on the "about tab", one of the first things you will see is the message "For instructions on how to read and use this data, please view the documentation available under the ‘About’ tab on this page." One person actually gave this page three stars. I wanted to give it zero stars, but that was not an option. I tried one star, but I was not registered, so my vote did not count. 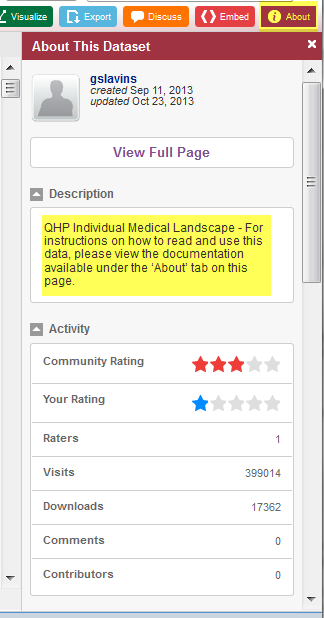 Out of 399,014 visits, only one person voted on the quality of the page. There are some links on the page, but none of them were at all helpful on how to use the page. After doing some external searches as to what some of the fields mean, I attempted to download data and it actually worked. 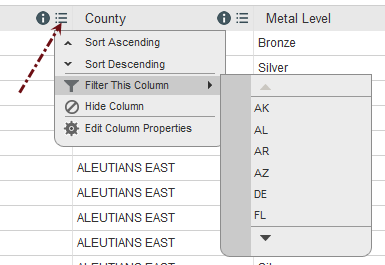 Rather than use the site tools, I did additional filtering, sorting, and column removal in Excel. I live in McHenry County, Illinois. There were 4216 plans for Illinois. There were 60 plans for McHenry County. I stripped off the columns for State, Issuer Name, Rating Area, and Display. Here are the results for McHenry County. Each of those plan names should be a link to a description of the plan so you can see what the hell you are getting for your money. Alas, there is no link. Nor is there a link to the issuer so you can call them. This is why you need to contact a certified In-Person Assister (IPA) to help you figure this all out. Alternatively you can call a Certified Application Counselor (CAC), a community health center, an insurance agent or an insurance broker. The rules say "States with partnership marketplaces must have a separate IPA program. States with state-based marketplaces can choose to have a separate IPA program. States with federally facilitated marketplaces are not permitted to have an IPA program"
Just call your IPA except in the 34 states where you can't. Then call someone else. I did as Steinberg did. I tried "Find Local Help" for my zipcode and found "461 results". Results display 10 at a time. Most of the contacts require a phone call to schedule an appointment. It seems you need a navigator to help you find a navigator. No problem. If you "didn't find what you were looking for" then the "Contact Us" button will take you to a page where you can "Find Local Help". Alternatively, you can start a live chat. Reader Tim Wallace did figure out how much extra Obamacare would cost him. My plan that I had for years no longer exists. So much for Obama's claim you can keep your existing plan. The truly affordable plan I used to have cost me $753.60 per month with a $5,450 family deductible. The most "affordable" plan with similar benefits will cost $1,360.09 per month, except the family deductible is now $11,000. So much for Obama's claim "your costs will be lower"
I am trying to clarify if I can even have a plan outside the company plan. Unfortunately the company plan is soaring to $2,100 a month because the plan is located in NJ and I live in NC. If I can have a plan in NC, it appears I will no longer be able to pay for it in pretax dollars like I used to. That is a hit of another 30% or so. Unfortunately, I am reading other similar horror stories. If you have a plan you like, I hope you get to keep it.